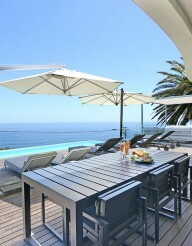 Villa Dolce Vita is the perfect tasteful and sophisticated Oceanside vacation accommodation, located in pristine Camps Bay – one of Cape Town’s most stunning cosmopolitan beachfront’s. The property boasts incredible endless vistas of both the sweeping coast that spreads into the emerald Atlantic sea, and the magnificent 12 Apostles mountain range with the iconic Table Mountain. Decorated in style, this roomy and contemporary unit is a fantastic choice for families, groups of friends, or business people. The house consists of six bedrooms that all come with their own large bathrooms. Four of the ocean-facing bedrooms lead out onto big verandas that are suspended over the sea. There is a deluxe private penthouse suite with dressing room and kitchenette that spills out onto an exclusive wooden patio, where you will find a Jacuzzi and spectacular panoramic vistas. A seventh bedroom can be arranged no request.